"MANOLETE - ARCHITECT OF MODERN TOREO"
The March Club meeting will take place on Thursday8th March at usual venue in London. The contribution made to the world of the bulls by Manolete will be discussed. Manuel Rodríguez Sánchez 'Manolete' wasn't just a leading figura of his time who happened to be killed in the bullring - he was one of tauromaquia's greats. Thanks to research and photos provided by RG, a CTL member based in Madrid, the meeting will feature a detailed presentation on the life and impact of Manolete. H.W. will cover the maestro's life and taurine career. Felix Sánchez del Río will look at the various controversies around Manolete, both during his lifetime and after his death; and TW will explain why today's bullfighting is indebted to the Cordoban's mould-breaking approach to toreo. There will also be a short film showing the torero in action. The Club is very fortunate to have been bequeathed some outstanding and rare items by past members (DEP). Click here for the catalogue detailing these valuable and sometimes unique items. Pre-auction bids may be accepted and purchased item can be arranged for collection or postage. These lots will surely enrich your life and your home, or be a perfect San Valentine's gift! SAN FERMIN in SAUDI ARABIA? Turki al Sheikh, new enterteinment Saudi minister announced during a press conference in Riad, on the 22nd Jan, that under the "SaudiProject" initiave, there are plans to organize a bulls related competition. According to navarra.com the bulls have already been shipped over, nevertheles there were no further details on the nature of the "competition".The saudi project twitter account showed pictures of San Fermin under the title "The Running of the Bulls". The perennially popular CTL quiz, took place in January 2019 at the usual venue, once more proving to be a sensational social gathering. 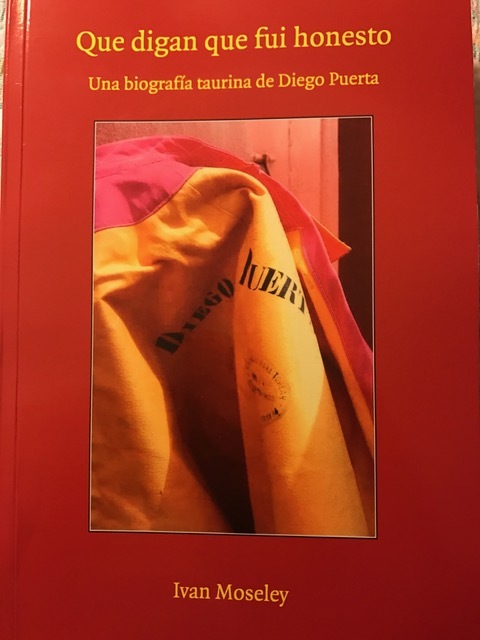 In the last meeting of the year the Club’s latest publication “The bulls the bullfighters and their world” by Muriel Feiner, was presented in its English edition for the first time. In tandem, Hinckley-based artist Neil Prior talk about how tauromaquia influenced some of his paintings and about the first time he watched a corrida, in the Monumental of Barcelona in 1979. Undoubtedly this was a great evening to end the year. Journalist and aficionado práctico Gonzalo Bienvenida, the taurine correspondent for El Mundo and Aplausos and commentator on the radio station Cadena SER as well as grandson of Antoinio Bienvenida will talk in English about his family (and show some previously unpublished photos) and about being an aficionado práctico. The meeting will start at 7.30 for 8 at the usual London venue. Madrid Feria Otoño informal lunch on 30th September, was well attended by over 20 new and old CTL members. A special toast for Mike P had all attendees standing up together. The September Club meeting held on Thursday, September 13 was joined by Carlos Lorenzo, the cousin of Alvaro Lorenzo, who talked about his experiences of travelling from plaza to plaza with Alvaro and about the realities of life on the road with a matador. D. Angel Peralta, The great "Centauro de las Marismas", honorary VicePreseident of the CTL, died in Seville on Saturday, April 7th. Born1925 in Puebla del Rio, Seville, he is said to have spent over half of his life on a horse. He is one of the great figures of the tauromaquie of the XXth century, one of the greatest contributor to the art of Rejoneo. He first appeared in La Pañoleta, at only 19 without having received any training and 3 years later, in 1948 he made it to Madrid. In 1955 he tried his luck in America, going to Mexico, Venezuela and Peru. Back in Spain he was at his peak during the 60s and 70s taking part in 126 corridas in 1971. He was recognized with the highest artistic award in Spain, Medalla al Merito de Bellas Artes in 2013. He was also a Poet, an animal lover, a self trained vet, a ladies man including the likes of Ava Gardner, an inventor, a horse and bull breeder and a very loved man. He was honorary Vice President of the CTL, a position that he held with much pride. The Club joins the world of Bulls to celebrate the life of the great Angel Peralta, who so generously gave us is his art. The February CTL meeting was held on Thursday, 8 February in the usual venue in London. THe traditional Quiz was held on January in a very festive way at the usual venue in London. Pepe Luis Vázquez was the Club´s December guest, he talked about his experience of growing up in a profoundly taurine family. Pepe Luis is the grandson of the acclaimed matador Pepe Luis Vázquez and almost all his paternal relatives were professional taurinos in some guise or another. Definitively an insightful and enjoyable evening to crown the end of 2017. Foreign Secretary Boris, a peculiar defender of the bullfight, as seen on 10th Nov'17 in the"Daily Mirrow" ...or maybe not? as seen on 11th May'16 in"City AM"
The 2016 Matador of the year, Curro Diaz, was the CTLs guest of honour of the 58th Anniversary Lunch wich was held in London on Sunday 26th November. Winners of the 2016 photographic competition were anounced during the lunch. The young and promising matador from Toledo, Álvaro Lorenzo, visited the CTL for the November monthly meeting. During over 3 hours, Alvaro talked about his youth and career and kindly answer all CTL members questions. Alvaro´s honesty became apparent not just in the ring, and he conquered the attention of all meeting attendees. After taking his alternativa in 2016, Álvaro faced 12 Corridas in 2017 in plazas as diverse as Las Ventas, Sevilla and Valencia, Santander, Toledo (his home) and Angra do Heroísmo (Azores). He is a direct peer of Ginés Marín and both were presented in Madrid as novilleros on the same day and both confirmed their alternativas on the same evening in May of this year.. Following Morante de la Puebla's announcement of his temporary retirement, the opinions about him have been more divided than ever: for some, his retirement is a catastrophe, others are really happy to see the back of him, But what do CTOL members think? Is Morante a Genius or a Fraud? In the 14th September meeting one Morantista socio and an non enthusiastic one defended their views on Morante after which a debate was opened to the audience. 36 year old Spanish matador Ivan Fandiño died Saturday 17th June in Mont de Marsan Hospital (south France) following a fatal horn wound in his side. It was in the ring of Aire-sur-l'Adour during a chiquelinas quite to 3rd bull 'Provechito' that Fandiño tripped into the pink cape and was caugh in his right side by a horn that blew up his liver, kidney and lung. Fandiño knew the wound was fatal "...hurry up for i am dying...", he had passed away by the time he arrived at the Hospital and the Doctors could not bring him back to life. His parents, Ecuatorian wife Cayetana Garcia Barona and baby daughter travelled to the French town near Pau to take him to his home town of Orduña, in the Spanish north region of the Basque country where he was be cremated, in a ceremony attended by numerous friends, family and other bullfighter workers of all ranks. Fandiño, a man of few words in public, had touched the glory of toreo, he was currently the only Basque bullfighter and continued to bring crowds to the ring hoping to see him replicate the glorious afternoons of 2015. He first wore the suit of lights in Llodio in 1999, and cut an ear as a novillero in Madrid in 2004. In 2005 he took his alternativa in Bilbao with El Juli as god father and Salvador Vega as his witness. Hard years went by, but finally his persistance brought fruit, in 2011 he was aclaimed the best bullfighter of San Isidro having cut 4 ears. The following seasons were fantastic in his career, being memorable his performance with a Parladé bull in Madrid. Elected Best Matador by CTL members two years in a row, 2013 and 2014 as shown below with cuadrilla in his CTL trophy presentation and in the London lunch November 2014. Fandiño made it to the few selected figuras on his own merit giving it all, blood and sense. On the 29th March of 2015 in Las Ventas he took a bet and did what will be remembered as the historic act of performing alone with 6 bulls from the hardest breeds: Palha, Partida de Resina, Victorino Martin, Cebada Gago, Jose Escolar and Adolfo Martín. Luck and inspiration did not came that afternoon and even if the public acknowledged the gesture his star begun to slowly fade, though his continued to be a name not to be missed in any important ring. He visited London as our CTL Lunch guess of honour a few years ago, and stole a smile from attendants when following a serious brief speech in Spanish he wished members a "Merry Christmas" in English. He did not try to please the people outside the ring but in the ring if you saw him right, it was not posible not to be impressed by his true interpretation of the art, always with unforgiving bulls. Juan del Alamo and French matador Thomas Dufau shared the tragic cartel in the small French town. 'Provechito' was meant to be the bull of Juan del Alamo. Ivan saw something in Provechito that made him do the quite, one perfect chiquelina, and then hell: he lost his foot and this time the bull did not forgive this man who now flows into the legend of toreo. The CTL is desolated and joins his wife, family, Nestor, his cuadrilla, his friends and the world of bulls in mourning a great torero. Rest in Peace Maestro Fandiño. Last appearance of Ivan Fandiño in Madrid was Monday 29th May during San Isidro 2017. He shared cartel with Morenito de Aranda and Gonzalo Caballero,with Jose Luis Pereda's bulls. In his first (the second) he showed he still had it, but did not break through. In his second (the fifh) he walked towards toriles like one goes to the gallows. He greeted the animal portagayola with a larga cambiada (picture courtesy of RG). Shrivers of fear, not joy. And then nothing, nothing and more nothing. That day las Ventas and Ivan held a minute of silence for Victor Barrio. 19 days after, in a hot day in June, in a town called Air, AIR!, Fandiño decided to do a quite to a bull that was not his. It was a vain quite, quite de lucimiento, no one gets ears for a quite. That sort of quite is perhaps the most generous act towards the public, and the most vain, it serves just to shine. Just to please. Thank you Ivan Fandiño for putting perfume in the Air that is life. CTL website user: Due to server issues the CTOL WEBSITE has been down. Fortunately this has now been fixed, however all updates since December 2016 have been irreparably lost. We apologize for any inconvenience this may have caused. MERRY CHRISTMAST AND HAPPY NEW YEAR 2018! December CTL Meeting 8 December was attended by festive CTL members who shared plans for the 2017 season. 5th October 2016-The Constitucional Court of Spain has declared the Catalonian Parlament is competent to regulate bullfights but not to ban them. The annoucement to revoke the ban has been postponed for unknown reasons . In July 2010 the Catalonian parlament decided to ban bullfights and the prohibition came into force on 2011. La Monumental de Barcelona is a privately own bullring which may raise hopes to the return of Corridas to Barcelona. At the end of the XIX century, 1896, Barcelona went on to be the Spanish city with more operative fix bullrings at the time. However the first antitaurine movements in the region are also recorded to have emerged in the beginnings of the XXth century. CTL monthly meeting took place on THURSDAY 6 OCTOBER in London. Paul Polansky, the award winning American author presented his incredibly entertaining recently published book ‘The Search for Bong Way Wong and the Chinese Bullfighters’. The Manchester torero and acclaimed CTL member, celebrated this milestone appearing in a corrida mixta in Benamocarra, Malaga, with bulls of Julio de LaPuerta and sharing cartel with "El Arqueno" and novillero Jose Antonio Lavado. Franck took his alternativa on 30th july 1991 in Chillon, Ciudad Real from the hands of El Soro as his padrino, Soro II as witness and bulls of Sanchez Arjona. CONGRATULATIONS MAESTRO what an honor to have you as a member! dies in Teruel after being fatally gored in the chest by his first bull, 'Lorenzo' 529Kg from ganaderia los Manos, SantaColoma.The wind uncovered Barrio during a muletazo and the bull pinned him down to the ground and caught him in the side. Unconstious, he was rushed to the enfermeria but was declared dead soon after. The horn perforated his lung and thoracic aorta. Victor Barrio who had a late start in the taurine world at 20, was 29 and had taken the Alternativa in Madrid in 2012 following a succesful career as a novillero having won among other trophies, the CTL best Novillero of the Year in 2011, as sawn in below picture. Saturday 9th of July was the last corrida of the 2016 Feria del Angel. In such tragic afternoon he shared cartel with Morenito de Aranda and Curro Diaz who were devastated at the news. The corrida was suspended. Victor Barrio had remarcable classic manners and unusual elegance in his conception of toreo. His death is the first of a torero in Spain in the XXI century, but follows the terrible deaths of El Pana and novillero Renato Motta in Mexico and Peru this year. The CTL joins in the taurine world sorrow and sends deepest sympathies to his wife, family, friends and anyone ever touched by his art. JULY CTL meeting was attended by over a dozen members who sat at a round table and discussed in a tertulia manner the current temporada and recent events. Despite some younger members having trouble remembering some of the memorable faenas of this season, the knowledgeable contribution of heavy weight members (such as the President, the Divisa co-editor, the young German vocal, the Ventas expert, the busy agenda lady and the East London water drinker) enlightened the chat, and there was plenty of room for some amusing stories. The Kill of El Toro de la Vega has been banned by a Decree passed by the PP conservative regional goverment of Castilla Leon. The socialist mayor of Tordesillas, where the festival takes place since it was reinstalled (having been banned by dictator Franco), will appeal. For those members of the public fearing this is a step back in the defence of a embedded cultural heritage, used as a political token, the Platform for the defence of El Toro de la Vega has created this website where you can leave comments or not. "Gored" about @ANTONIOBARRERAC. was the subject of April's meeting. February 2016 - RAFAELILLO's visit to the CTL and Toreo de Salon session reported on Spanish TV news Tele 5.